A good email template can make or break your marketing, but designing and building a template from scratch can be a very time-intensive process. Instead of creating a template from the ground up, let us save you hours of precious time with these 10 places to grab your very own email template. Simply download a template and customize it to fit your specific needs. Oh and did we mention... They’re free! The following sites offer free email templates or template builders to get your next email campaign up and running in no time. Take a look at what's out there for free and grab a new template to make your next campaign capture more clicks than ever before! Not to pat our own backs too hard or anything, but our template has gotten a lot of attention. It features a few different types of content blocks that can be replicated or removed with no problem. We built it with two breakpoints, one for tablets and another for small devices like phones and iPods. It's fully tested to render great on all clients. Grab it here totally free and see what you can do with it! We can't write about free templates without mentioning ZURB's awesome tool. 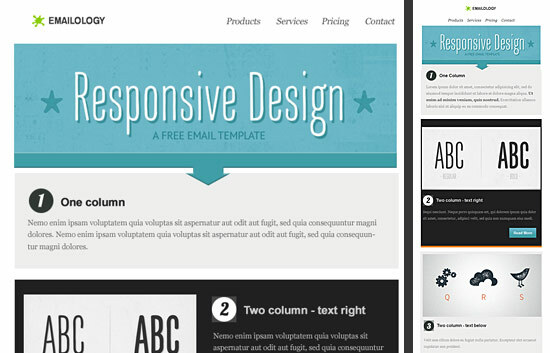 They offer five different templates, all of which are responsive and pretty well made. The best part is, it's totally free. Go to their site for yourself, or check out one of the templates in your browser, below. Campaign Monitor provides excellent email services from start to finish, including a super cool template builder. You can use it for free, no account required, and it does a bang up job of making templates for your needs. Once you're done creating, you can import it straight into your Campaign Monitor account or download it for free and go from there. The folks at Campaign Monitor also run an excellent blog with lots of helpful tips, go check it out! ActiveCampaign is a full service ESP that provides sending services, marketing automation and email templates, along with their online email designer tool. Check out some previews of the templates they offer here, or sign up for a free account and log in to see for yourself. To find their templates once logged in, click on the Campaigns tab, then on "Email Templates" on the right side of the screen. Their library includes 52 templates that range from very simple (single column, white background) to more complex. 99 Designs offers this free template pack on their blog, which includes 3 templates in 4 colors. These include a newsletter, a promotional email and a notifications template. This trio would make a great starter package for a business that's trying to establish a consistent look. If you want something a little more custom, consider taking advantage of 99 Designs' crowd sourced design contests. You should have no problem finding an amazing design at a good price. This site offers 70+ of email templates for free, so it shouldn't be hard to find the right one for you. Use the categories on the right side of the page to browse for the perfect free template. All you have to do is download and customize their readymade email templates for your business! Benchmark Email offers some free templates with its service, which you can try free for 30 days. Benchmark focuses on promoting events through email, and they have a huge library of over 400 templates to support this. They categorize their templates by industry, but it only takes a few copy and image changes to convert a template for your specific niche. GraphicMail is an ESP that hosts a sizeable library of email templates. You'll have to sign up for an account to get access to their templates, but don't worry: it's free. For 15 days you'll have access to their support team and all their cool features, but after that you'll have to pony up to keep getting the good stuff. 15 days should be plenty of time to check out their templates and see if they've got something to offer for you and your business. Want to customize these templates to better reflect your business? Personalize these templates in a flash with fresh copy and images to ensure your brand is resonating through the design. In no time you can turn your next email campaign into a lean, mean prospect converting machine! What's your go-to place for free templates? Let us know in the comments below!